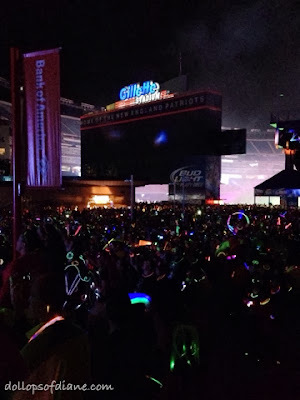 Last Friday night, I laced up my sneaks and headed to Gilette Stadium for the Electric Run 5K. I honestly was not excited about it. In fact, I was pretty much dreading it. 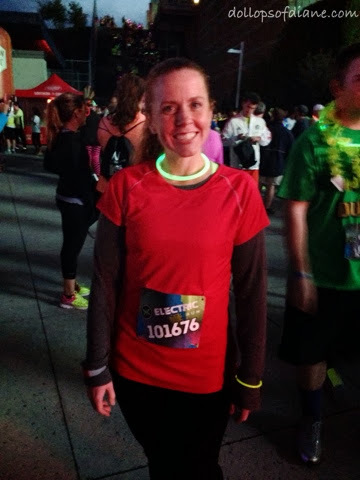 If you've been following along you know that I ran my first 5K ever this summer and then the Diva Dash last month. The problem is that I keep signing up for races but when all is said I just don't like to run. Plus, during the races and after I just feel down on myself. I want to be a better runner. I want to be faster. I want to like it - but I don't. So when the Electric Run arrived (which I had signed up for a while ago), I was expecting another torturous race. They also had 15,000 registered runners and I envisioned traffic and parking being a nightmare. Much to my surprise though I actually had a really good time! I easily parked, met up with my friend the Maven of Savin and her sister, and we headed to the starting line. The atmosphere was so fun that it would be hard not to have a good time. There were no timing chips and not even a clock at the end. The vibe was all about having a good time. Some people ran the whole thing, some walked the whole thing, and some did a combo of both (that's what we did). The course went around the parking lot of Gilette and then into the actual stadium. At the end they had a stage with music and glow sticks galore. The whole night was a lot of fun and I MIGHT even *gasp* consider doing it again sometime (someone please stop me).